Broccoli, potato and kale soup. This week, I was determined to stretch out my grocery shopping and put it off for a few days. We still had a little bit of vegetables and fruit, but were almost out of eggs and cheese, which are a staple in our *almost* vegetarian household. I decided I would try to do some batch cooking and make some meals for the next few nights by using what we had, despite the fridge looking pretty bare. Normally I am on top of using up ingredients but I had started to fall behind a bit. For each recipe I would choose one ingredient that was close to being thrown away or needed to be used up. First up meal number 1 involved using a really sad looking broccoli I had forgotten about sitting in the crisper. It was in a plastic bag, so was still kind of fresh, although its colour was more a shade of yellow than green it was to good to compost so I set about making a soup. I chopped up and onion and a 2 cloves of garlic, and fried them in a splash of oil. Then diced the entire broccoli- including stems and leaves and added this to the pot, then covered it with water. I realised at this point one broccoli was going to make a pretty meager soup, so chopped up 5 whole small potatoes and some salt. Again making sure the vegies were covered with water. 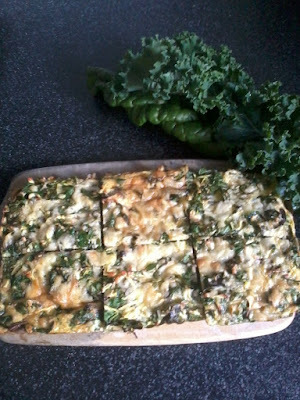 Once they were cooked, I added about a quarter cup of milk powder, some pepper and a couple of handfuls of kale and silverbeet from the garden. Voila- broccoli, potato and kale soup. We ate this for dinner with hot buttered toast and it was delicious! I will definitely make this again. Meal 2 was based around a soft zucchini. One of our quick and easy meals here is zucchini slice, however I changed my regular recipe to accommodate for less egg and cheese and more vegies. I used 3 beaten eggs, 1 c plain flour, the grated zucchini, a splash of water, 1/2 a c of oil and mixed this well. Then added some chopped silverbeet- thank goodness for our winter garden! I pored this into a non stick slice tray and used the last of our cheese grated on top which was under 1/4 of a cup. I then baked it in the oven for 20 minutes, until the top was brown and served it with some frozen corn cobs and par cooked pumpkin. This was a busy evening, and I was so grateful to be able to just put it all in the oven for reheating. For meal number 3 was 3/4 of a Dolmio tuna pasta bake sauce jar. This was given to me by a friend and I had opened the jar and added a couple of tablespoons to another recipe, which was fine but we decided by itself it tasted strange. I don't buy any prepared sauce jars so think we are just to used to my homemade white sauce! But now wasn't the time to fussy so I found 2 quarter filled bags of different shaped pasta-spiral and penne and added these to a pot of boiling water. Then when cooked stirred in the jar of sauce, half a tin of tuna, along with some salt, pepper and more chopped kale. I topped it all with some breadcrumbs and baked in the oven. Most of us didn't mind it, Mr 10 ate it but was not impressed and would not eat any of the leftovers lol. I think you could make a similar meal just using a tomato based jar or tinned tomatoes if you had them in the pantry. I really enjoyed my little self imposed challenge and am happy these ingredients didn't end up in the bin. Have you ever made a "fridge soup" or any other super frugal meals? Wow! What a challenge. You are so creative. :) Love it. Dear Mel, I love it! Yes I make a few fridge things... one is fridge pizza. Its amazing what you can put on a pizza. If I have left over pesto I use that as pizza topping. I've been reading back over the last year or so while sipping my coffee, and I'm enjoying my visit! Have a very blessed week.